I’ve been having a problem with my instant hot water system lately. This system circulates electrically heated water throughout my house using a small pump. The pump is wired into a ground fault interrupter (GFI) module. Every now and then, the GFI trips, leaving me without hot water. What I need is an alarm to tell me when AC power on that outlet has been turned off by the GFI. I figured a 9v battery powered loud chirping beeper would be the ticket for this kind of alarm. The chirping sound would draw my attention and let me know that I need to reset the GFI switch, without waking the whole neighborhood. 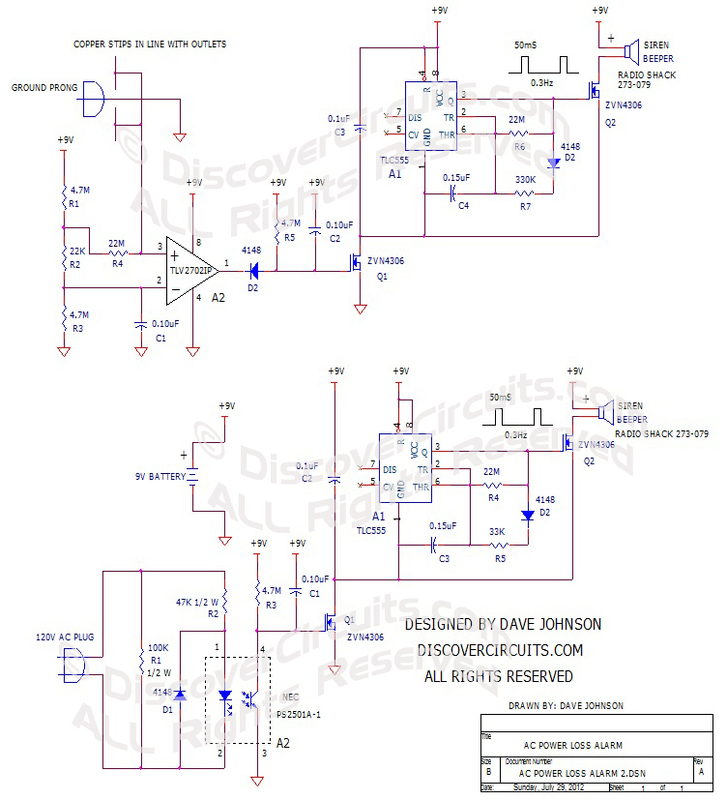 My circuit is shown below. I had a choice between two different ways to detect when AC power was turned off at the GFI outlet. One method used a small opto-isolator, a diode and a resistor, which is connected directly to the two power prongs on the GFI output. This method brought 120vac into the box. This circuit would be foolproof but would decrease the overall safety of the alarm box. Another method was a bit unorthodox. 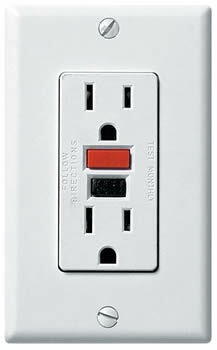 It sensed the electric field emitted by the active prongs on the outlet, using a pair of copper strips inside the box. I still used the 3rd ground prong on the outlet as a means to hold the box onto the outlet, putting the copper strips into predictable positions over the sockets. Two copper strips are used so the box could be plugged into either the upper or lower socket. In case people had problems with the non-contact method, I show both sensing methods in the schematic below. 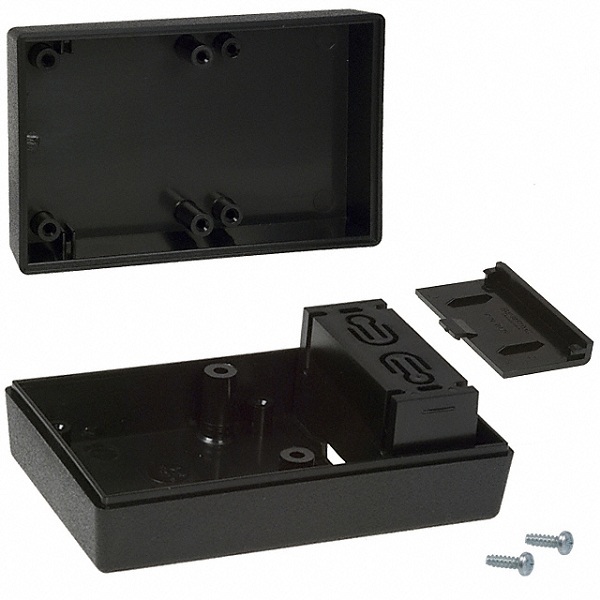 The alarm housing I suggest is a small plastic box, which has a convenient 9v battery compartment, available from Digikey. 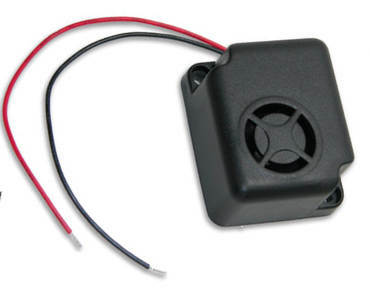 The circuit is powered by a 9v battery and is packaged in small plastic box with a 9v battery compartment. A very popular opto-isolator is used to monitor the power line. As long as there is AC power to the input, the n-channel FET Q1 is kept turned off. As soon as power is lost, +9v is switched to the beeper circuit. I used a CMOS version of the 555 timer to produce a 50ms pulse every 3 seconds. The output of the timer drives an n-channel FET which in turn drives a very loud siren type beeper, available from Radio Shack. The result is a sound maker which is very loud but only produces short chirps. The sound is loud enough to be easily heard without drawing a lot of average current from the 9v battery. Using the short 50ms pulses every 3 seconds, the average current when beeping is reduced to about 2 milliamps. In standby mode the current is about 2 microamps.